We are living through a crisis of attention that is now widely remarked upon, usually in the context of some complaint or other about technology. That’s how Matthew Crawford starts his 2015 book The World Beyond Your Head, his inquiry into the self in an age of distraction. He was prompted to write the book by a profound sense of unease over how the ‘attentional commons’ was being hijacked by advertising and digital media. One day, he was paying for groceries using a credit card. He swiped the card on the machine and waited for a prompt to enter his details to appear on the screen. He was surprised to find that he was shown advertisements while he waited for the prompt. Somebody had decided that this moment — the moment between swiping your card and inputting your details — was a moment when they had a captive audience and that they could capitalise on it. Crawford noticed that these intrusions into our attentional commons were everywhere. We live, after all, in an attentional economy, where grabbing and holding someone’s attention is highly prized. There is something disturbing about this trend. What we pay attention to, in large part, determines the quality of our lives. If our attention is monopolised by things that make us unhappy, anxious, sad, self-conscious, petty, jealous (and so on), our lives may end up worse than they might otherwise be. I am sure we have all shared the sense that the social media platforms, video and news websites, and advertisements that currently vie for our attention can have a tendency to do these very things. I find I have become obsessed with the number of retweets I receive. I constantly check my Facebook feed to see if I have any new notifications. I’m always tempted to watch one last one last funny cat video. My attention is thus swallowed whole by shallow and frivolous things. I am distracted away from experiences and activities that are ultimately more satisfying. Proposition 1: Attention is valuable and hence something worthy of protection. Proposition 2: Attention is increasingly under threat, i.e. there is greater need/cause for protecting attention nowadays. Proposition 3: We should (consequently) recognise a right to attentional protection (doing so might be politically and practically useful). My analysis of these propositions is my own, but is heavily influenced by the work of others. Jasper L. Tran’s article ‘The Right to Attention’ is probably the main source and provides perhaps the best introduction to the topic of attentional rights. He casts a wide net, discussing the importance of attention across a number of domains. But there is something of an emerging zeitgeist when it comes to the protection of attention. Tristan Harris, Tim Wu, Matthew Crawford and Adam Alter are just some of the people who have recently written about or advocated for the importance of attention in the modern era. Attention = focused conscious awareness. We all live in a stream of consciousness (occasionally interrupted by sleep, concussion, and coma). This stream of consciousness has different qualitative elements. Some things we are never consciously aware of — they are unseen and unknown; some things we are only dimly aware of — they hover in the background, ready to be brought into the light; some things we are acutely aware of — they are in the spotlight. The spotlight is our attention. As I sit writing this, I am dimly aware of some birds singing in the background. If I force myself, I can pay attention to their songs, but I’m not really paying attention to them. The screen of my laptop is where my attention lies. That’s where my thoughts are being translated into words. It’s where the spotlight shines. This definition of attention is relatively uncontroversial. Tran, in his article on the right to attention, argues that there is, in fact, little disagreement about the definition of attention across different disciplines. He notes, for example, that psychologists define it as ‘the concentration of awareness’, and economists define it as ‘focused mental engagement’. There is little to choose between these definitions. So granting that the definition is on the right track, does it help us to identify the value of attention? Perhaps. Think for a moment about the things that make life worth living — the experiences, capacities, resources (etc.) that make for a flourishing existence. Philosophers have thought long and hard about these things. They have identified many candidate elements of the good life. But lurking behind them all — and taking pride of place in many accounts of moral status — is the capacity for conscious awareness. It is our ability to experience the world, to experience pleasure and pain, hope and despair, joy and suffering, that makes what we do morally salient. A rock is not conscious. If you split the rock with a pickaxe you are not making its existence any worse. If you do the same thing to a human being, it’s rather different. You are making the human’s life go worse. This is because the human being is conscious. Cracking open the human skull with a pickaxe will almost certainly cause the human great suffering and, possibly, end its stream of consciousness (the very thing that makes other valuable things possible). (1) Consciousness is valuable (hence worth protecting). (2) Attention is a form of consciousness (focused conscious awareness). (3) Therefore, attention is valuable (hence worth protecting). But this argument throws up a problem. If attention is merely a form of conscious awareness, then what is the point in talking specifically about a right to attentional protection? Shouldn’t we just focus on consciousness more generally? I think there is some value to focusing specifically on attention. Part of the reason for this is practical and political (I talk about this later); part of the reason is more fundamental and axiological. As I suggested in my definition, there are different levels or grades of conscious awareness. Attention is the highest grade. It has a particular importance in our lives. What we pay attention to, in a very real sense, determines the quality of our lives. Paying attention to the right things makes for higher levels of satisfaction and contentment, and it is only in certain states of acutely focused awareness that we achieve the most rewarding states of consciousness. I have a couple of examples to support this point. Both are originally taken from Cal Newport’s book Deep Work, which I enjoyed reading over the past year. The central thesis of Newport’s book is that certain kinds of work are more valuable and satisfying than others. In particular, he argues that engaging in ‘deep work’ (which he defines as ‘activity performed in a state of distraction-free concentration that pushes your cognitive capacities to their limit and produce new value, insight etc’) is better than ‘shallow work’ (which is the opposite). In chapter 3 of his book, he sets out to defend this claim by discussing how deep work makes life more meaningful. The value of attention features heavily in his argument. He discusses the work of two authors who have highlighted this. Like fingers point to the moon, other diverse disciplines from anthropology to education, behavioral economics to family counseling, similarly suggest that the skillful management of attention is the sine qua non of the good life and the key to improving virtually every aspect of your experience. This chimes with my own experience. I find that my outlook and sense of well-being is far more affected by what I pay attention to on a daily basis than on what I achieve or by improvements my overall life circumstances. Those things are important, don’t get me wrong, but they count for less than we might think. The benefits of achievements are often short-lived. You bask in the glory for a few moments but quickly move on to the next goal. Improvements in life circumstances quickly become the new baseline of expectation. The benefits of what you pay attention to are more sustainable. A life in which you focus on important and pleasurable things is a good life. This gains additional support when we consider how certain forms of torture work (they often work by forcing you to pay attention to displeasurable things) and how people tout the benefits of meditation (by focusing your attention on the here and now you can improve your psychological well-being). The other author Newport uses to support his thesis is the psychologist Mihaly Csikszentmihalyi, who is best-known for his work on the concept of ‘flow’. Csikszentmihalyi set out to understand what it is that makes people really happy, i.e. what daily activities make them feel good. Were people happiest at work or at play? Interestingly, Csikszentmihalyi found that people were often happiest at work. Why was this? His answer was that work enabled people to enter states of concentrated, focused awareness that were intensely pleasurable and rewarding. He called these ‘flow states’. He subsequently developed a theory of flow. The theory holds that you enter into a flow state when you are engaging in some activity that pushes your cognitive capacities to their limits. In other words, when you are doing something that tests your abilities but that is completely beyond your abilities. Engaging in such activities fills your attentional sphere. They are so demanding that you cannot focus on anything else. This means you don’t have time to pay attention to things that might make you unhappy or put you ill at ease. A flow state is perhaps the highest state of attentional focus and, if Csiksentmihalyi is to be believed, the one that is central to the fulfilling life. Content protection: ensuring that we pay attention to things that make our lives go better (things that are meaningful and contribute to well-being) and that we are not constantly distracted by things that are trivial and unimportant. Capacity protection: ensuring that we acquire and retain the capacity for extreme concentrated awareness (i.e. the capacity to enter flow states). You may not be entirely satisfied with the preceding argument, but set aside your objections for now. If we assume that attention is valuable and worth protecting, we must confront the next question: why is it worth protecting now? After all, if attention is valuable surely it has been valuable for the entire history of humanity? What is special about the present moment that demands a right to attentional protection? There’s a simple answer and a more complex one. The simple answer is that no one who is currently concerned with attention would deny that it has always been valuable and worthy of protection. We probably didn’t recognise it before now because we didn’t have the conceptual vocabulary to effectively articulate the right and the political and social climate that would be receptive to a rights-claim of this sort. The more complex answer returns us to the opening quote: the one I took from Matthew Crawford. There is something about the present moment that seems to involve a ‘crisis of attention’. Our attentional ecosphere has become dominated by smart devices, addictive apps, social media services, and ubiquitous advertising. This is making it increasingly difficult to pay attention to things that matter and to retain the ability to focus. Goals: Doing something with a target or end state in mind makes it more likely that it will grab your attention. It gives your efforts a purpose. Modern information technology has made it easier to identify and track our achievements of certain goals. It has also made seemingly arbitrary or meaningless goals more salient and attention-grabbing. Goals such as getting 2,000 Instagram followers, or beating your Strava segment times, are not only novel, they are also more easily brought into our attentional spotlights. Feedback: Getting feedback on what you do tells you what is worth doing (what you are good at) and hence what is worthy of your attention. Modern technology makes it easier to get this feedback. Tracking and surveillance software can give you precise, quantifiable data about your actions, and social media platforms allow others to comment, criticise and cajole us into trying the same thing over and over. What’s more, designers of games and apps often provide attention-grabbing feedback that is relatively unimportant (known as ‘juicing’ in game design) and can mask losses as wins (e.g. loud noises, badges, flashing lights). This further engrains an activity in our attentional spotlight. Progress: Having the sense that you are getting better at something often makes it more attention-grabbing. The ideal is to create an experience with extremely low barriers to entry (anyone get started and enjoy) but which then rewards time and effort put in by making the experience more challenging. Alter gives the example of Super Mario Bros as a game that had this ideal mix. He then notes that contemporary game designers use similar design principles to hook people into particular games on smartphones and social media platforms (Farmville, Candy Crush, Kim Kardashian’s Hollywood). They often then exploit this attentional-hook by adding in-game purchases that are necessary if you wish to make progress in the game environment. Escalation: Having the sense that you are triumphing over adversity and that the stakes are being constantly raised often makes something more attention-grabbing. To be honest, I’m not entirely sure what the distinction is between this and the previous one, but as best I can tell it has to do with encouraging someone to believe they are acquiring mastery over a particular set of skills (as opposed to just giving them a sense of progress). Again, Alter highlights how modern game designers are experts at doing this. Adopting Csikszentmihalyi idea of flow, he notes how they create game environments that get people to operate just outside their comfort zones. This makes for a more immersive and rewarding experience. Alter also argues that humans have certain ‘stopping rules’ (cues that encourage them to end a particular behaviour) and that technology erodes or undermines these stopping rules. Cliffhangers: Having the sense that a task or experience has not yet been completed can make it more attention-grabbing. This idea goes back to the work of the Russian psychologist Bluma Zeignarik who did experiments revealing that when you open a ‘task loop’ in your mind, it continues to occupy considerable mental real estate until it is closed off (i.e. until you complete the task). This has become known as the ‘Zeignarik Effect’. Alter notes how modern media (particularly serial television shows and podcasts) exploit this effect to encourage ‘binge’ watching/listening. The ‘autoplay’ features on Netflix and Youtube also take advantage of this: they automatically open loops and present you with the next episode/video to sate your desire for more. Social Interaction: Sharing an experience with others and getting feedback from them can make it more attention-grabbing. Suffice to say, social media platforms such as Twitter, Facebook and Instagram are excellent at facilitating social interaction of the most addictive kind. They allow for both positive and negative feedback, and they provide that feedback on an inconsistent schedule. To reiterate, and to be absolutely clear, there is nothing necessarily technological about these six ingredients. 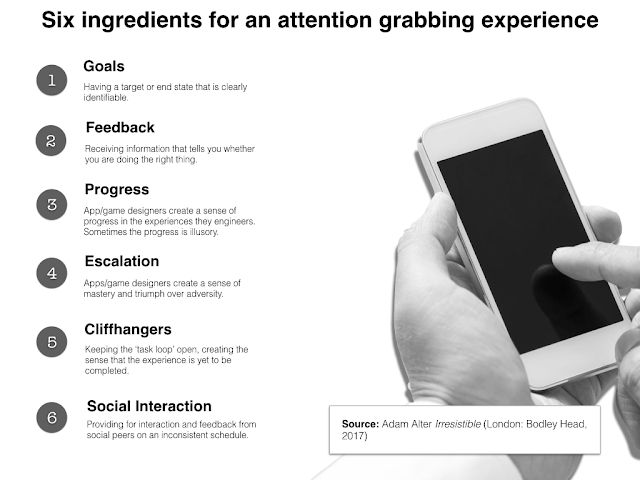 You could engineer attention-grabbing experiences and products using these six ingredients in an offline, non-technological world. Indeed, Tim Wu, in his recent book The Attention Merchants highlights the many ways in which this has been done throughout human history, suggesting in particular that religions were the original innovators in attentional engineering. Alter’s point is simply that technology makes it easier to bring these six features together to make for particularly absorbing experiences. But is this a bad thing? Not necessarily. Here we run into a major problem with the argument in favour of a right to attention. As noted earlier, attention is central to the well-lived life. Paying attention to the right things, and being completely immersed in their pursuit, is a good thing. Consequently, using the six features outlined by Alter to engineer immersive and attention-grabbing experiences is not necessarily a bad thing. If the experiences you have engineered are good (make individual lives better), then you might be making the world a better place. To suggest that we are living through a ‘crisis of attention’, and that this crisis warrants special protection of attention, requires some additional, and potentially controversial, argumentative footwork. First, you have to argue that the kinds of attention-grabbing experiences that are being fed to us through our digital devices are, in some sense, worse or inferior than the experiences we might be having without them. One way to do this would be to channel the spirit of John Stuart Mill and suggest that there are ‘higher’ and ‘lower’ experiences and that, in the main, technology is a fetid swamp of lower quality experiences. I think there is some plausibility to this, but it is complicated. You could argue that being totally immersed in video games - to the exclusion of much else - is ‘lower’ because you are not achieving anything of intrinsic worth. The time spent playing the game is time that could be spent (say) finding a cure for cancer and making the world a better place. You could also argue that the jockeying for position on social media platforms cultivates vicious (as opposed to virtuous) character traits (e.g. competitiveness, jealousy, narcissism). But you probably couldn’t argue that all technologically-mediated experiences are ‘lower’. Some may involve the pursuit of higher pleasures and goods. A blanket dismissal of digital media would be wrong. Second, you would have to argue that the vast array of potentially absorbing experiences on offer is deeply distracting and hence corrosive of the ability to concentrate and achieve flow states. This seems like an easier argument to make. One thing that definitely appears to be true about the modern age is that it is distraction-rich. There are so many games, movies, podcasts, and social media services that are competing for our attention that it becomes hard to focus on any one of them. We get trapped in what Fred Armisen and Carrie Brownstein called the ‘technology loop’ in their amusing sketch from the TV series Portlandia. In this sense, it doesn’t really matter whether the experiences that are being mediated through these devices are intrinsically worthwhile (whether they consist of the ‘higher’ pleasures); the distraction-rich environment provided by the devices prevents you from ever truly experiencing them. If these three arguments are correct — if it is easier to engineer attention-grabbing experiences; if the majority of the experiences involve ‘lower’ pleasures/pursuits; and if the environment is too distraction rich — then we may well be living through an acute crisis of attention in the present era. 3. Why a ‘right’ to attentional protection? You could accept the first two propositions and still disagree with the third. It could be the case, after all, that attention is valuable and is under threat but that it is neither desirable nor useful to recognise a specific ‘right’ to attentional protection. Further argumentation is needed. Fortunately, this argumentation is not too difficult to find. One reason for favouring a ‘right’ to attentional protection is simply that doing so is the normatively/morally appropriate thing to do. Look at how other rights-claims are normatively justified. They are usually justified on the basis that recognising the right in question is fundamental to our status as human beings (to our ‘dignity’, to use the common phrase) or because doing so leads to better consequences for humankind. The right to property, for example, can be justified on Lockean ‘natural’ right grounds (that it is fundamental to our nature as human beings to acquire ownership over our material resources) or on practical economic grounds (the economy runs better when we recognise the right because it incentivises people to do things that increase social welfare). Presumably similar justifications are available for the right to attentional protection. If the likes of Winifred Gallagher and Mihalyi Csikszentmihalyi are correct, for example, then the skilful management of attention is integral to living a truly satisfying human life (it is the ‘sine qua non’ of the good life, to use Gallagher’s phrase). Protecting this ability to manage attention would, thus, seem in keeping with the requirements of human dignity and overall social well-being. But normative justifications of this sort are probably not enough. It’s possible that we could ensure our dignity as attentional beings, and improve the societal attention-quotient, without recognising a specific ‘right’ to attentional protection. To justify the ‘right’ would seem to require a more practical set of arguments. Fortunately, this is possible too. You can favour the notion of a ‘right’ to attention on the grounds that doing so will be politically and practically useful. Contemporary political and legal discourse is enamoured with the language of rights. To recognise something as a right carries a lot of force in public debate. 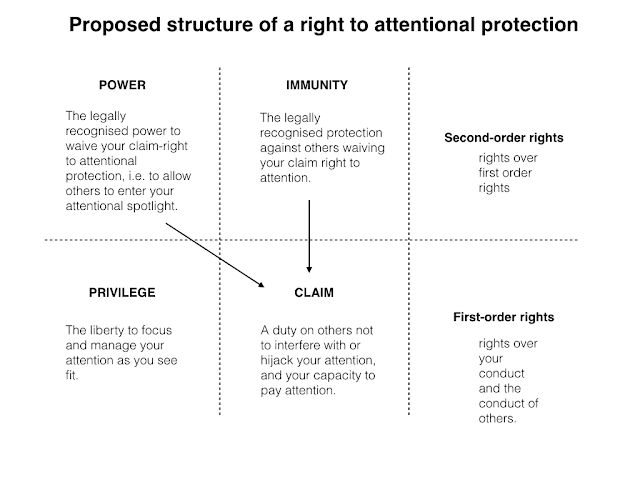 If we seriously think that attention is valuable and under threat, it may, consequently, be much to our advantage to recognise a right to attentional protection. We are more likely to be heard and taken seriously if we do. On top of that, if a right to attentional protection does get recognised in law, it carries further practical significance. To understand this, it is worth stepping back for a moment and considering what a legally protected right really is. The classic analysis of legal rights was conducted by William Hohfeld. Hohfeld noted that claims to the effect that such-and-such a right exists usually breakdown into a number of more specific sub-claims. Privilege: The freedom/liberty to do with your body as you please. 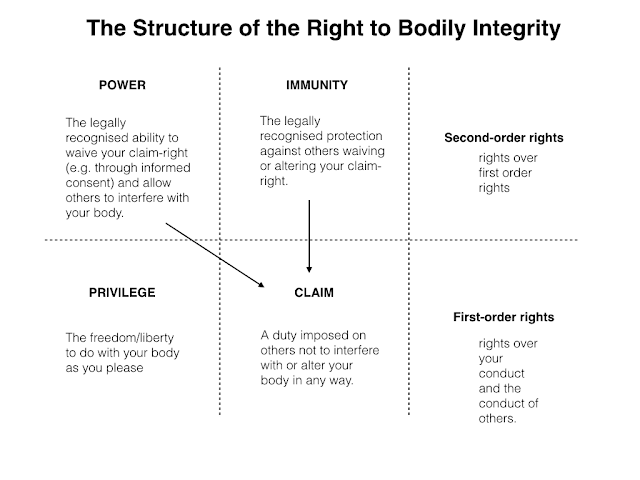 Claim: A duty imposed on others not to interfere with or alter your body in any way (this is what we usually associate with the use of the term 'right'). Power: The legally recognised ability to waive your claim-right (e.g. through informed consent) and allow others to interfere with your body. Immunity: The legally recognised protection against others waiving or altering your claim-right (i.e. not to be forced to give up your claim right). Privileges and claims are first order incidents: they regulate and determine your conduct and the conduct of others. Powers and immunities are second-order incidents: they regulate and determine the content of the first order incidents. 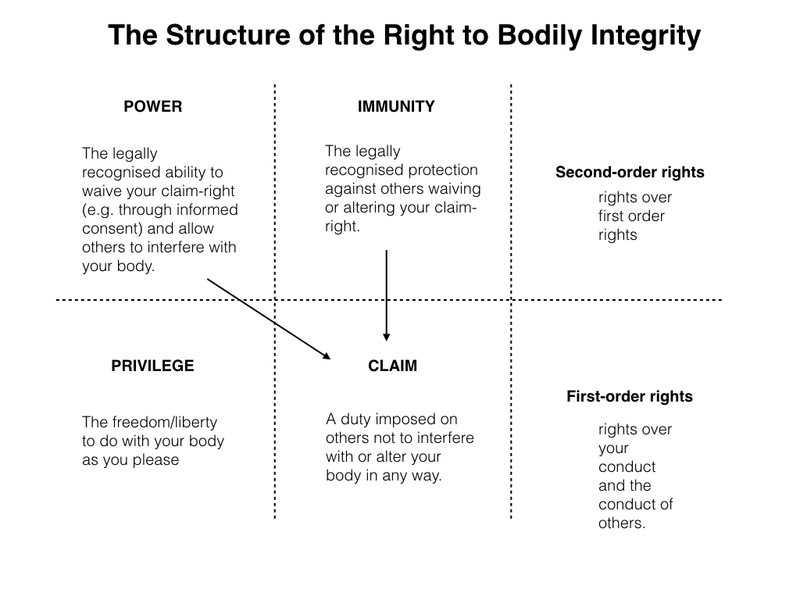 Using this four-part model, you can map the relationship between the different elements of the right to bodily integrity using the following diagram. All rights can be understood as combinations of these four incidents, but not all contain all four. For example, you could have a claim right (against interference by another) without necessarily having a power or immunity. Similarly, the basic elements of a right can be qualified in many important ways. 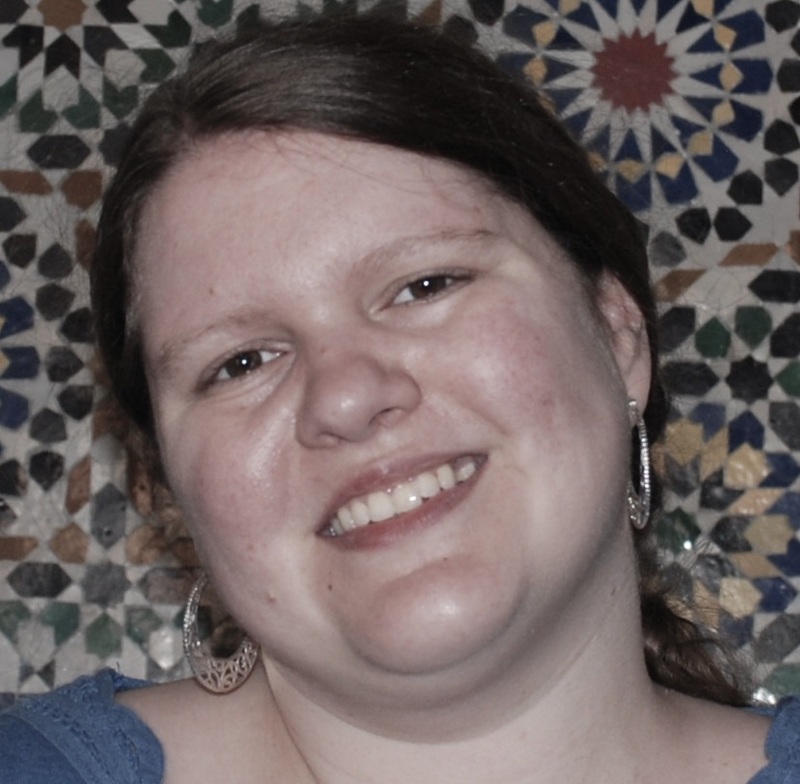 For instance, the privilege to do with your body as you please is limited in many countries to exclude the right to sell sexual services or body parts. Likewise, the immunity against others interfering with your claim right might be a qualified immunity: if a law is passed through a legally legitimate mechanism that eliminates the claim, you may no longer be entitled to it. Some rights can be quite limited and qualified; some rights can be given the strongest possible protections. Privilege: The liberty to focus and manage your attention as you see fit. Claim: A duty on others not to interfere with or hijack your attention, and your capacity to pay attention. Power: The legally recognised power to waive your claim-right to attentional protection, i.e. to allow others (people or experiences) to enter your attentional spotlight. Immunity: The legally recognised protection against others waiving your claim right to attention (e.g. by selling off a claim to your attention to others). I think these four incidents would need to be qualified in certain ways. The arguments I outlined earlier in relation to the precarious nature of attention in the modern era would seem to imply some degree of paternalism when it comes to the protection of attention. The fear, after all, is that modern technology is particularly good at hijacking our attention and that we are not the best protectors of our own attention. This would seem to qualify the privilege over attention. Furthermore, and as Jasper Tran notes this in his article, there may be a duty to pay attention to certain things in certain contexts (e.g. a jury member has a civic and legal duty to pay attention to the evidence being presented at trial). Thus, there cannot be an unqualified privilege to pay attention to whatever you like (and, correlatively, to ignore whatever you like). All that said, it would seem that the right to attentional protection does warrant reasonably robust recognition and enforcement. After all, attention is, if the arguments earlier on were correct, integral to human well-being. To this point, I have been looking at the case in favour of the right to attentional protection. I’m going to conclude by switching tack and considering various problems with the idea. I’ll look at four issues in particular. I have some thoughts about each of them, but I’m not going to kid you and pretend that I know what to do with each of them. They pose some serious challenges that would need to worked out before a defence of the right to attentional protectional became fully persuasive. The first issue is that the right to attentional protection might conflict with other important and already recognised rights. Tran discusses the obvious one in his article: the freedom of speech. If I have a right to speak my mind, surely that necessarily entails a right to invade your attentional ecosphere? Or, if not a right to invade, at least a right to try and grab your attention. There seems to be some tension here. Tran responds to this by arguing that the right to attention and the right to freedom of expression are analytically distinct: you have a right to speak your mind but not a right to have others pay attention to you. That’s certainly true. But the analytical distinction ignores the practical reality. If you have people out there speaking their minds, it would be difficult to insure that they don’t, at least occasionally, trespass on someone else’s attention. That said, how much weight is ascribed to the freedom of expression varies a bit from jurisdiction to jurisdiction, and commercial products have always been subject to more stringent regulations than, say, journalism, literature or other works of art. Furthermore, clashes of rights are common and the mere fact that one right will clash with another doesn’t, in itself, provide reason to reject the existence of that right. The second issue concerns the practicality of protecting attention. You might argue that it is impossible to really protect someone’s attention from interference or hijacking. To be alive and conscious, after all, is to be bombarded by demands on your attention. How could we possibly hope to protect you from all those demands? The simple answer to this is that we couldn’t. To argue that there is right to attentional protection does not mean that there is a right to be protected from all interferences with your attention. That would be absurd. Analogous areas of the law have dealt with this problem. Take the right to bodily integrity again. Most legal systems impose a duty on others not to apply force to your body. This is usually protected by way of laws on assault and battery. But, of course, simply being alive and going out in society entails that sometimes people will bump into you and apply force to your body. Legal systems typically don’t recognise such everyday bumps and collisions as part of the duty not to apply force. They save their energies from more serious interferences or infringements. A similar approach could be adopted in the case of a right to attentional protection. The third issue concerns the redundancy of the right to attentional protection (i.e. its overlap with other pre-existing rights). There are a lot of rights already recognised and protected by the law. Some people may argue that there is an over-proliferation of rights-claims and this dilutes and attenuates their usefulness. In the case of the right to attentional protection, you could argue that this is already adequately protected by things like the right to privacy and bodily integrity, the freedom of conscience, and the restrictions on fraud, manipulation and coercion that already populate the legal system. This is probably the objection with which I a most sympathetic. I do worry that much of what is distinctive and interesting about the right to attention is already covered by existing rights and legal doctrines. That said, there mere fact that there are already mechanisms in place to protect the right does not mean that the right should not be recognised. Recognising the right may provide a useful way to organise and group those existing mechanisms toward a particular purpose. Furthermore, I do think there is something distinctive about attention and its value in human life that is not quite captured by pre-existing rights. It may be worth using the label so as to organise and motivate people to care about it. 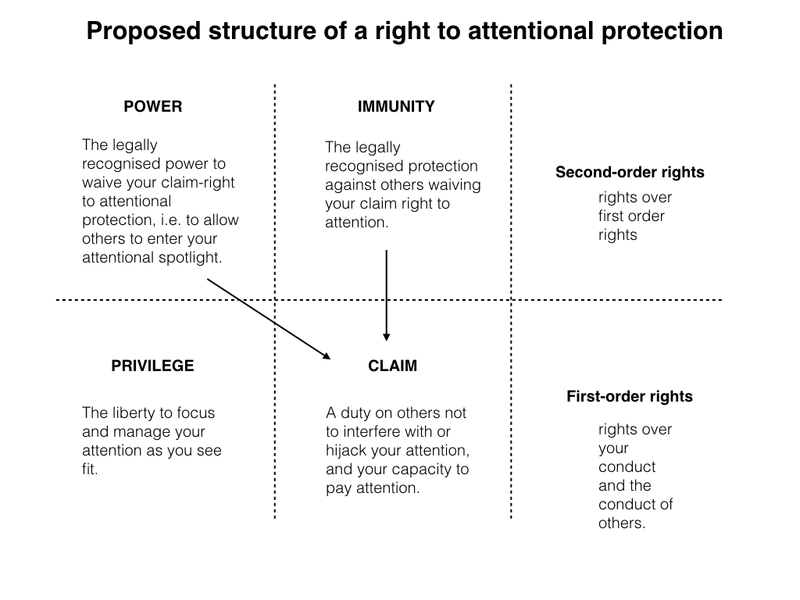 Finally, even if we do recognise a right to attentional protection, there are a variety of questions to be asked about the mechanisms through which the right is protected. One big question concerns who should be tasked with recognising and protecting against violations of the right. Should it be up to the individual whose right is interfered with? Or should there be a particular government agency (or third sector charity) tasked with doing so? Or some combination of both? Giving the job to someone other than the individual might be problematic insofar as it is paternalistic and censorious: it would involve third parties arguing that a particular attentional interference was harmful to the individual in question. There are also then questions about the legal remedies that should be available to ensure that attention is protected. Should the individual have a right to sue an app-maker or social-media provider for hijacking their attention? Or should some system of licensing and regulatory sanction apply? One possibility, that I quite like, is there should be dedicated public spaces that are free from the most egregious forms of attentional manipulation. That might be one way for the state to discharge its duty to protect attention. Suffice to say, there is a lot to be worked out if we ever did agree to recognise a right to attentional protection.